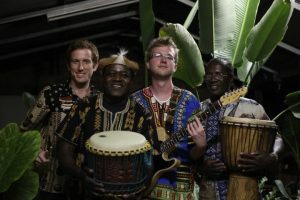 Headed by Zimbabwen musicians Felix Machiridza and Ben Mutondazi, Zambezi Sounds bring their sweet and spiritual Nyami Mbira and talking bass of the Zambezi River to Cobargo. Backed by Chilean percussionist Sinuhe Pachecco, Tom Sherringham on melodic guitar and Andrew Howard on drumkit. Their repertoire includes a hypnotic and highly danceable mixture of contemporary and traditional African rhythms, classic reggae, stories and songs.